Days after haredi youths stabbed, beat Arab bus driver, court orders key suspect freed after ruling assault was not nationalistic. The Jerusalem Magistrate Court on Monday ordered police to free a haredi youth arrested following an assault on an Arab bus driver in the haredi city of Modiin Illit last week. 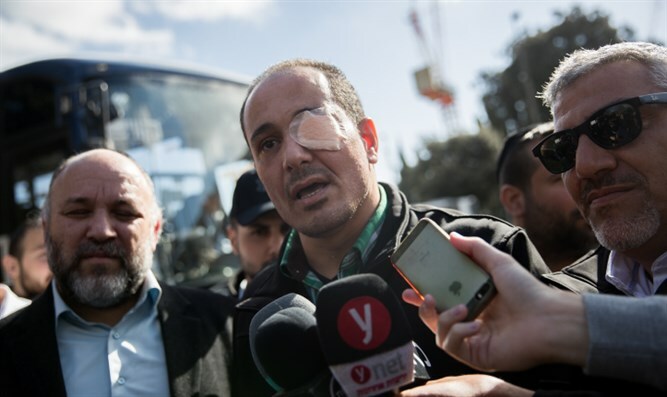 On Thursday, two haredi youths assaulted Nidal al-Faqi, a resident of the eastern Jerusalem neighborhood of Shuafat, in Modiin Illit, while al-Faqi was working as a bus driver for the Kavim bus company. During the incident, the two suspects blocked the bus with their car, and when al-Faqi called on them to move, the two youths exited the vehicle, boarded the bus, and after speaking briefly with the drier, assaulted him. The two assailants beat al-Faqi, stabbed him in the eye, and cut his neck, before fleeing the scene. Emergency medical responders were called to the scene to treat al-Faqi and evacuate him to an area hospital. Witnesses claimed that the assailants attacked al-Faqi after they identified him as an Arab. Al-Faqi and fellow drivers claimed the attack was nationalistically motivated as an act of revenge following the deadly terrorist shooting in Givat Assaf earlier on Thursday that left two IDF soldiers two and two more Israelis wounded. Drivers launched an impromptu strike following the attack on al-Faqi, forcing passengers off buses and refusing to complete their routes, leaving hundreds of travelers stranded. On Monday, police apprehended one of the two suspects, a resident of Modiin Illit in his 20s. Following his arrest, however, Judge Havi Toker rejected accusations that the attack was nationalistically motivated, ruling the incident to be the result of a traffic dispute between the driver of the private car and the bus driver. Judge Toker noted in her ruling that al-Faqi was accused of attacking the suspects first, and of spitting on them during the confrontation. The suspect was released to house arrest.